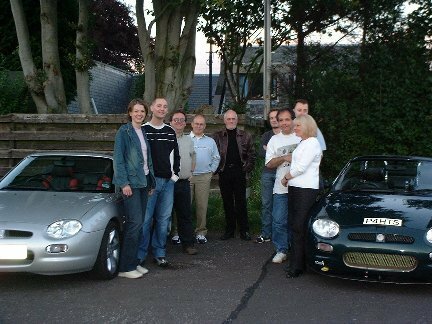 Not long after the introduction of the MGF, some owners from Scotland got together and formed a Group called MGF Scotland. The problem was that because the model was so new, the recognised clubs north of the border did not organise any events specifically for MG’s latest ragtop. So, MGF Scotland did just that and very successful they were at it too. Unfortunately, the group ceased to exist a few years ago. In 2002, Scottish owners of MGFs and the new TFs were still having problems finding events specifically for their cars within easy striking distance of their home. At the start of September, a few of us from the Forth / Clyde Valleys decided to organise a get together. We used the MG Enthusiasts BBS to advertise the event and agreed to meet on the evening of Thursday 5th September at Stirling. To everybody’s surprise we had people from as far away as Aberdeen in the north and Dudley in England showing an interest. Obviously the people from so far away couldn’t make it just for a drink and a chat, although, the one from Dudley did (he was in Glasgow on business). All those attending this first meeting felt that it would be better if we stayed independent of other clubs such as the MGCC and MGOC and that we should be a “Group” without any office bearers where everybody has an equal say on what goes on in the future. Central Scotland MGF was born. Since that inaugural meeting nearly six years ago, CSMGF is still going strong. We meet regularly and go for runs, even during the winter months. One of the members was heard to say “it’s like going my holidays every few weeks”. While the Group was set up for MG’s latest sports cars, occasionally other older models join us. You’ll see from the photographs in the “Outings” part of the site that an MGB GT V8 and an RV8 join in from time to time. So, if you have an F or a TF and want to come along keep an eye on this website's Notice Board.